Genomics, Medicine, and Pseudoscience: CRISPR gene editing controversy - does it cause unexpected mutations? 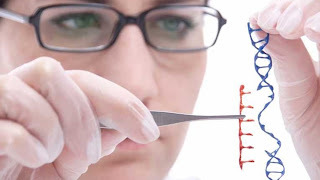 CRISPR gene editing controversy - does it cause unexpected mutations? Just over a month ago, a short paper appeared in Nature Methods saying that the gene editing technique known as CRISPR-Cas9 has a big problem: it creates unexpected mutations all over the genome. This was startling news for a technique that has been hailed worldwide as a dramatic breakthrough, not only because it is the easiest gene-editing method yet invented, but also because it is (supposedly) very precise. "We feel it's critical that the scientific community consider the potential hazards of all off-target mutations caused by CRISPR." Not surprising, the resulting news headlines were gloomy. The stock in three companies trying to commercialize gene editing–Editas Medicine, Intellia Therapeutics, and CRISPR Therapeutics–all fell sharply. (Interestingly, the stocks started falling on May 24, and bottomed out on May 31. The paper appeared online on May 30.) Scientists involved with these companies quickly responded, arguing that the study was flawed, but of course those scientists have a lot of money at stake. Who was right? Well, a new paper by Caleb Lareau and colleagues, just released in the bioRxiv preprint repository, re-examines the same data and concludes that CRISPR is just fine. I've read both papers so you don't have to. Here's what seems to be going on. The study by Schaefer et al. used CRISPR-Cas9 to create mutations in two mice (called F03 and F05), and then sequenced their genomes. They also sequenced the genome of a third mouse, called FVB. All three mice were supposed to be genetically identical. Then they compared all three genomes to a "reference" mouse to find mutations. (Aside: this is something my own lab does all the time, so I know the techniques well.) They found over 1,500 mutations in each mouse (which wasn't surprising, because the reference mouse differs from their 3 lab animals), but they found hundreds more mutations in the two CRISPR-edited mice. That was the main surprise from Schaefer's paper, and it's the basis for their claim that CRISPR causes numerous off-target mutations. I had a big problem with this claim even before reading Lareau's paper. Just TWO mice? That's a ridiculously tiny sample. But I digress. Lareau et al. pointed out, correctly, that Schaefer's conclusion depends on the mice being genetically identical. But what if the two CRISPR mice (F03 and F05) were closer to each other than to the third mouse, FVB? (It's analogous to comparing two siblings with a first cousin, although these mice are much more inbred than any humans.) In that case, the result falls apart. Fortunately, Schaefer et al. made all their data available (props to them for doing that), so Lareau could answer this question quite precisely. It turns out that F03 and F05 are much closer to each other than either one is to FVB. Lareau discovered that the two CRISPR mice share thousands of mutations that FVB doesn't have. "the CRISPR-treated embryos most likely already harbored these private SNPs and indels prior to nuclease treatment whereas the control mouse did not." In other words, it seems highly unlikely that CRISPR gene editing caused hundreds of unexpected mutations in these mice. A final note: this kerfuffle illustrates the tremendous value of rapid publication through pre-print archives. Lareau et al. 's paper appeared a few days ago (July 5) on bioRxiv, along with all the data they used to support their arguments. We'll probably see a journal version too, but that will take months. Getting this paper out faster was a win for science.